Now a Days, Ubuntu is one of the most popular OS among programmers (not only nerds but also the beginners who just entered into the programming world) but for a beginner Ubuntu user coming from Windows may feel some problem in programming with Ubuntu. On Windows they use nice GUI based IDE, but in Ubuntu things are little different. In Ubuntu it’s better to use Terminal (specially for the beginners), instead of GUI based IDEs such as Eclipse, Netbeans etc for compiling programs. In fact, the command line approach is much easier and efficient, due to the powerful shell such as bash, zsh etc. 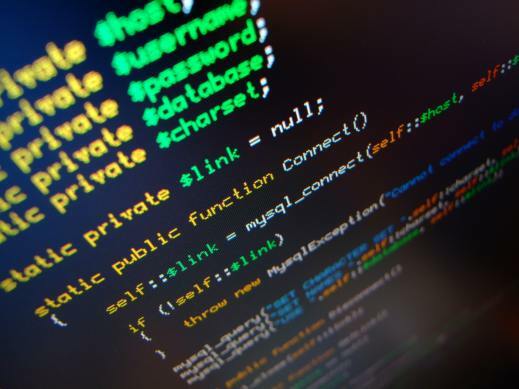 So, in this post – you will learn – how to compile and execute (run) C/C++ programs in Ubuntu 12.04 (Precise Pangolin)/12.10(Quantal Quetzal) or other Linux distributions such as Linux Mint 13 (Maya). You don’t need to install any extra applications or tools other than the compiler. The default text editor – gedit will work fine for source code editing (unless you have a preferred source editor such as Emacs, Vim, Nano, Kate or something else). if leave the -o option (name of the output file) then by default a.out will be created as the executable output file. Ubuntu 11.10 (Oneiric Ocelot) is one of the most popular operating system for programming because there are lot of great open source applications, tools, compilers, debuggers, IDEs are available free of cost. Some of them are – GCC – The greatest compiler for C language (from FSF (‘Free Software Foundation’ by Stallman); Linux Torwalds used GCC while developing Linux Kernel), Eclipse IDE (The most popular ‘Integrated Development Environment’ for Java programmers), Netbeans, KDevelop, Codelite etc. C/C++ language is a high level programming language (although the term high and low is used in relative sense e.g C is a high level language as compared to Assembly but if we compare it with java then C is a low level programming language; the term high or low basically describes the closeness with hardware). Most of the operating systems has been written in C language. This post has been written for beginners who just started learning C/C++ or the programmers who have migrated from Windows to Ubuntu (although the commands are almost same for all Linux based operating system). If there is no syntax/semantic error in you program then the compiler will successfully generate an executable file, otherwise fix the problem in your code. C/C++ is one of the most popular programming language, mostly used in system programming (system software development e.g Most of the modern operating systems are programmed (primarily) either in C language or C++). C is a High Level language as compared to Assembly program, so it comes in the middle of Assembly and Java like High Level Language… That’s the beauty of C – it’s very easy to write program in C as compared to Assembly programming and fast execution time as compared to Java. By default, Ubuntu 11.04 (code name:=Natty Narwhal) or any other Linux Based Distribution like Fedora, Linux Mint(10 or 9), Debian etc.. are very good for programming purposes(e.g C, C++, Java, PHP, Perl, Scripting, Ruby etc.). A lot of free and open source tools like IDE, debuggers are available which will makes the programming a lot Funky, with Ubuntu. 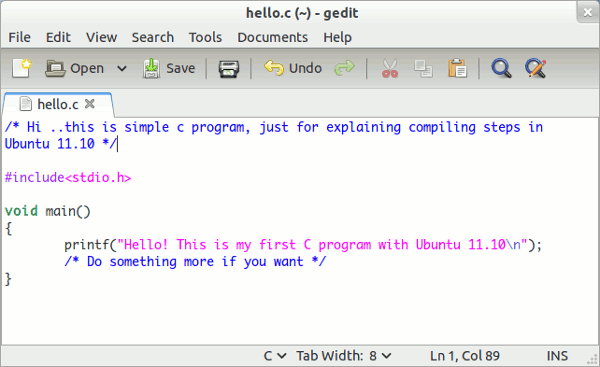 In this post you will learn how to compile a C/C++ program on Ubuntu 11.04, from command line, you can also use some IDE like Eclipse, NetBeans if you want (but it’s not recommended for beginners). Ubuntu 11.04 comes with gcc(GNU Compiler Collection), installed by default which is one of the most widely used modern C compiler. #2 : Now you compile the program using GCC compiler (I think it’s installed by default in most versions in Ubuntu, but if it’s not the case then install it by typing – sudo apt-get install gcc at terminal). Open the Terminal (CTRL+ALT+T) and type the command (First move on to the directory where your file is located, I assume you have created the file on Desktop, If you are an absolute beginner – Learn Some basic Linux Commands). The -o option (specifies the Output File Name) in the following command is optional, but it’s a good practice, because if you won’t specify that – then a default a.out file will be created (which will eventually overwrite older a.out file in that directory). To compile C++ program, you may need to install g++. Then all the remaining procedure is almost same. Just replace gcc by g++ from the above tutorial and instead of a basic/simple c program, use C++ program. GCC-GNU Compiler Collection version 4.6.0 is out! GCC(GNU Compiler Collection, version 4.6 was released a day ago) is a compiler available free under GPL by GNU Foundation. it is cross platform and is written using c/c++. Actually GCC has a major role in the growth of open source/Free Software world, in the past few years. A majority of C/C++ programmers uses GCC, on Linux based operating systems as well as on Windows/Mac OS X. Since I uses Ubuntu 10.10 as my primary desktop; I know how important ,the gcc is, for programming Fun. GCC is mainly used as a compiler for C,C++,java,Fortran,Pascal,Ada,Objective-C.
A lot of extra features can be added with help of freely available plugins. GCC is one of the best compiler for c programmers. GCC vs 4.6.0 has released(on March 25,2011). Go here for Complete details on the features of GCC.